I don’t think that I can buy that in a can. I know that “patina” means different things to different people, crafts and practices, ranging from the sum of all influences altering the appearance of an object or surface to a more limited effect of a particular procedure altering one or more of the aspects of appearance, such as color, sheen, depth, pattern of shading or highlighting. 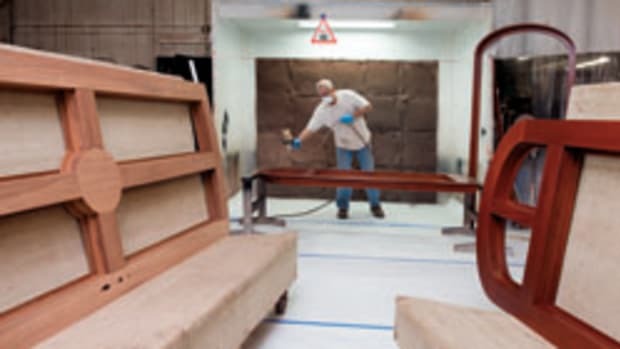 For purposes here, I’ll try to stick with what the finisher and the customer might agree on when attempting to finish or refinish an antique, reproduction or brazenly new piece of furniture that has an enhanced appearance of age and use. My associate has decided not to try to reproduce the sofa so that it looks like the original when it was first built and finished, but to incorporate techniques that as closely as possible resemble that use and aging that could have affected the look and feel of the original over its lifespan if it had been properly maintained. He might put physical distress marks in the wood to simulate worn edges, scratches around a pull or small nicks in heavy wear areas, and will almost certainly sand sharp edges that would get worn down from use. Starting with the wood itself, he will seek to create the color that the wood would acquire as it oxidized, darkening or fading from exposure to light. If the wood is too dark, bleaching might be necessary, followed by an application of dye to start developing the desired color without covering up the wood with pigment. Other chemicals can be used to shift the color of specific woods. He will use a pigmented stain over the dye stain, applied so that a subtle pattern emphasizing the figure of the wood shows up, but doesn’t overpower or hide the wood. 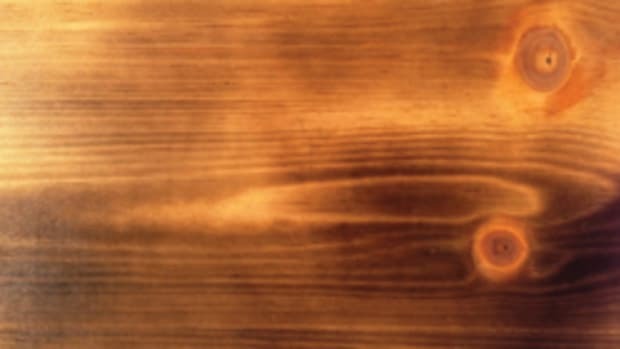 He might use a washcoat of sealer to mitigate the adhesion of the pigment to the wood or apply the pigmented stain directly onto the wood, which will allow a greater “bite” to the wood. Shading or toning: Most finishers use these terms to indicate an addition of color, usually in a coating material such as a spray-applied transparent or semitransparent mixture of dye or pigment and lacquer. There is much disagreement about the difference between shading and toning. I will avoid that for this article. Whatever the term used, the process subtly alters the color. Glaze: Glaze can be thought of as a product as well as a process. The product is usually a liquid or paste colored with a pigment, which can be applied over a coating or sealer rather than to the bare wood. It can be wiped off selectively, leaving only a haze of color, or left “hanging” in low places in the surface such as scratches, dents, holes, the lower parts of the profile of moldings, carvings or other surface detail. Crackle (craquelure): Special crackle lacquer can be used to create a pattern of fine cracks similar to those formed in old paint as it dries and shrinks over time. A dark glaze applied over this textured surface will emphasize that pattern. Tinted topcoat: All of the clear coating material (lacquer, shellac, varnish) can be tinted with pigment or dye to provide a transparent layer or layers of color at various levels in the coating build. Most of the clear coatings have some color, from a pale yellow to darker amber or golden tones. Shellac and lacquer especially add depth to a finish and are considered softer or warmer than a water-clear coating such as acrylic. Sand through: Abrasively removing some portion of the finish to reveal layers of finish closer to the wood, simulating wear can add interest to a piece, but it is easy to overdo. The effect should be natural-looking and should not appear as recent damage. Break through: This technique involves using two or more different colors of paint. Once one coat has dried, a dab or smear of paste wax or Vaseline is added to prevent portions of the next coat — usually a different color — from adhering well. When the last coat has dried, it’s scraped with a putty knife to simulate a flaked or peeling finish. Dusty wax: This combination of mineral spirits, paste wax and a powdered solid such as pumice is used much like a glaze to achieve a dusty, dirty and old look in the finish. It can be used over a fairly glossy topcoat and buffed to a lower sheen. 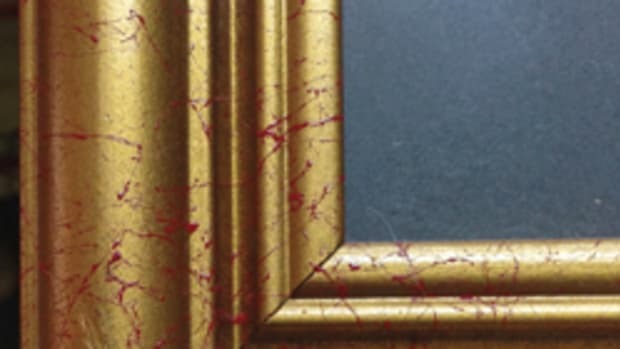 This technique is often used on picture frames and furniture. Finding premixed dusty wax can be difficult, but it is easy to make. Dry brush: Glaze or paint can be applied with a soft full brush with very little color on the bristles. Unlike a glaze technique calling for coverage of a general area followed by wiping off most of the applied color, this technique applies color very sparingly, not wet enough to flow at all. Greg Williams, formerly senior touchup and finishing instructor for Mohawk Finishing Products, is now a freelance instructor and consultant.